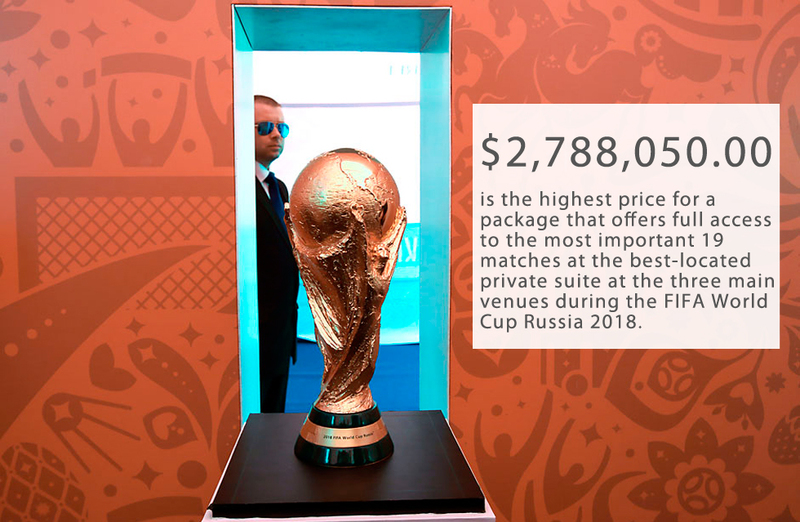 Number of the week: How much for highest priced package at the World Cup? On June 7, 2016 FIFA, football's governing body, began sales for the most expensive tickets to the 2018 World Cup. Twenty packages called the “Bolshaya Troika” (“Big Three”), ranging from $1.4 million to nearly $2.8 million, guarantee luxury hospitality and the best available seats at 19 matches in Moscow and St. Petersburg, including the Opening Match, both Semi-finals and the 2018 FIFA World Cup Final. Standard seat tickets haven’t gone on sale yet and their price range is still unknown. The tournament will be staged at 12 different stadiums in 11 cities across the country. The opening ceremony will take place on June 14 and the final match will be played on July 8. Both events will be held at Luzhniki Stadium in Moscow.